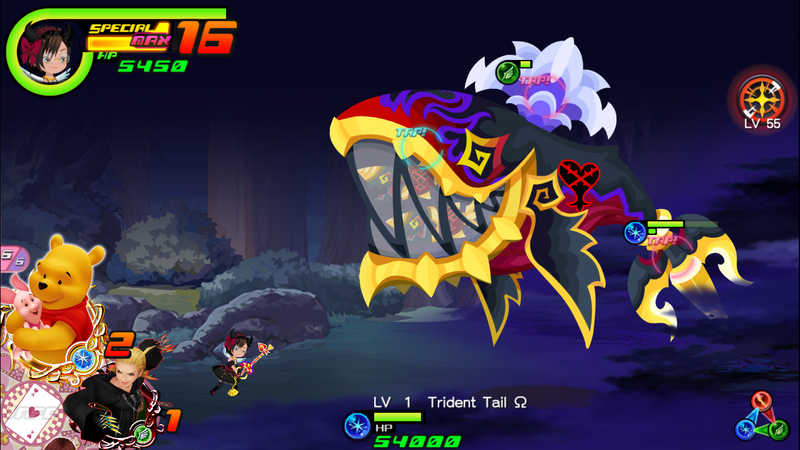 Today’s article is going to be the first of a few epic boss battle themes that are used in the Raid Boss battles in Kingdom Hearts Union Cross. All of these themes were used originally in Kingdom Hearts I, for various boss battles. This one, “The Deep End”, was first heard in KHI during the battle with Ursula (“The sea and all its spoils BOW TO MY POWERRRRR“). The topic of interest for today is inspired by the track, though is not entirely illustrated by it: vamping. No, it has nothing to do with vampires. Let’s first listen to “The Deep End”. Now what is a “vamp“? A “vamp” is a short musical passage that can be played over and over and over. This concept is most often found in musicals, where the musicians in the pit orchestra (ensemble below the stage) must wait for certain cues from the actors for what music to play next, usually during a spoken part of a song. If the characters are having a conversation between verses, the musicians will play a passage over and over, to accommodate however long it takes the actors to say their lines. How does this relate to “The Deep End”? Well in the beginning of the piece, before the epic piano downward melody at 00:30, almost all of the instrumental sections are playing the same thing over and over. The low brass are playing a slow-moving melody, but everyone else’s parts are very repetitive. Certainly not a bad or boring kind of repetition, but still repetition nonetheless. It reminds me of a musical vamp, and I could see this beginning part being repeated over and over while Ursula and Sora (or whoever the protagonist and antagonist are) exchange some witty banter and then the piano melody might come in when the actual battling begins. This doesn’t actually happen—I simply could see it happening. Music that interacts with what is going on is one of the best parts of musicals–and video games. I absolutely love when music adds in different parts and layers depending on what is happening. That is one key common characteristic of musicals and video games that really stands out to me.